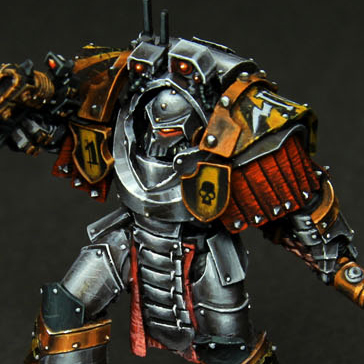 The Horus Heresy always seems to bring out some of the best painters. 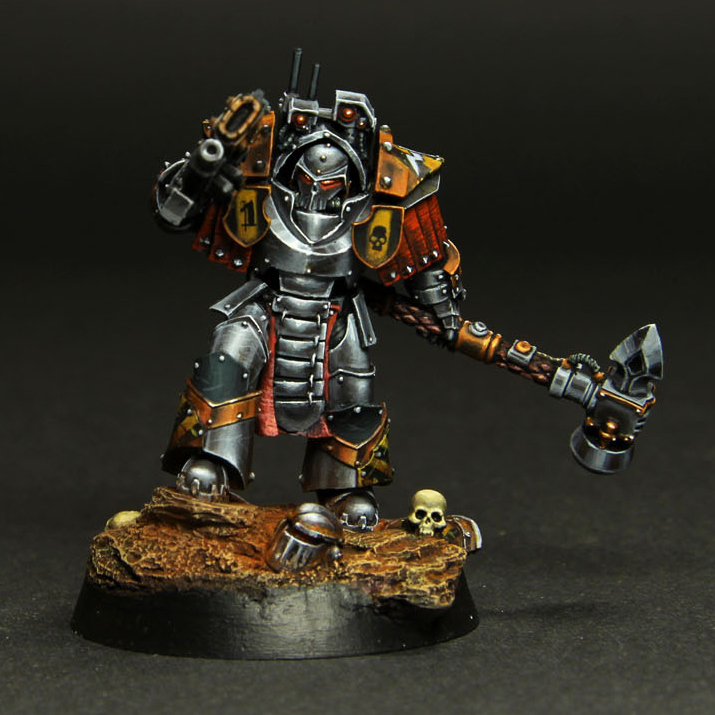 Doing an Iron Warrior in all non-metallic metal is a pretty impressive feat if I do say so myself, and they have really pulled it off with this guy. There's no conversion except for a head swap using one of the Iron Warrior helmets and some work on the base, but it works. It's simple and tripped down, perfect for the Iron Warriors. I really like how the iron parts have been handled on this. Getting all of the reflections right is impressive on its own, but the inclusion of all of the little scratches and subtle use of browns really pushes it over the top. It all looks so seamless. The brass banding is pretty good to, though the ones on the shoulder guards look a little off to me. Everything is crisp and smooth, with just the right amount of weathering to ground the model in reality. The choice to use a helmeted head really emphasizes the detached, calculating nature of the Iron Warriors in a way that a bare head wouldn't. The base has just the right amount of detail too, conveying the sense of a scene and a place, but not overpowering the model, instead acting as a frame.